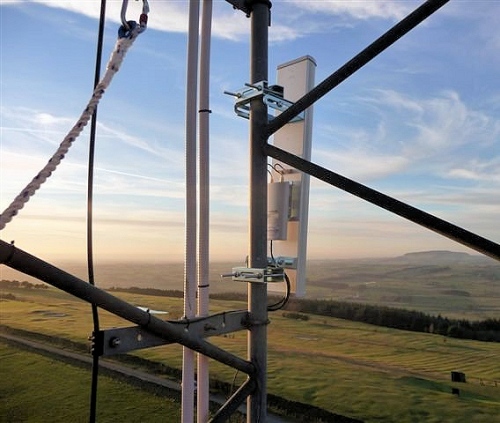 Wireless ISP Boundless Networks has today announced that they’ve become “one of the first companies in the UK” to trial a new 160Mbps capable “ultrafast” Fixed Wireless Access (FWA) broadband network, which could soon be rolled out across rural parts of North Yorkshire. The provider already serves a good number of homes and businesses across Yorkshire and Lancashire in Northern England, although their best “unlimited” residential package is currently limited to a top download speed of 30Mbps (4Mbps upload); this costs about £44.99 per month on a 30 day contract (plus £150.00 one-off for a professional installation). However the ISP, which aims to keep pace with Government expectations and the new drive towards “ultrafast” (100Mbps+) capable connectivity, has just launched the first trials of a new wireless network technology that can deliver data speeds of 160Mbps+ (Megabits per second). The first to benefit are residents and businesses in the village of Bradley, near Skipton, which is home to about 1,300 people. We note that Openreach’s (BT) fixed line Fibre-to-the-Cabinet (FTTC / VDSL2) network is also present in some parts of the village, although local performance seems to struggle. A little FTTP may also be floating around in small spots. Apparently the new network will be rolled out across North Yorkshire over the next two years, although there’s no mention of whether or not it will be extended to reach their customers’ in neighbouring Lancashire. The latter is of course home to B4RN’s excellent 1Gbps community fibre optic network. ISPreview.co.uk asked Boundless for a bit of extra information on the network setup and the ISP has kindly obliged. The new network used the Mimosa A5c access point with an MTI 65° antenna. This operates on the 5GHz band and Boundless used 40MHz channels. For the homes, Boundless installed Mimosa C5 devices at a maximum distance of 2.5km. All connected to 1Gbps of fibre backhaul located around 6 miles from the village. 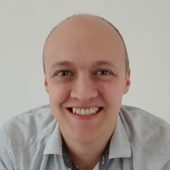 At present the network is still under trial and so we don’t yet have any final pricing, but this should be confirmed in the not too distant future. Otherwise the company claims to have one of the “largest wireless coverage footprints” of any such provider in the country, with coverage of over 3,500 square miles with approximately 4,000 wireless links in service and they operate a private national fibre network from their data centre in Manchester. Most of Boundless’s masts are fuelled by high-capacity fibre optic cables and end-users are then reached by another fibre optic cable or a Microwave (radio) based link. So they are using WiFi @ 5Ghz to provide high speed internet access. A more refined version of a cantena. on another note, it looks like even Google are realising the last mile is best served using wireless than laying fibre. It will be interesting to see if more operators like Boundless pick up the high speed challenge using wifi before the major operators steam in with their 5G offerings. wireless is definitly the dominate infrastucture of the future. but it makes sense that wireless 4g/5g/wifimax will succeed fibre. Low implementation costs, accessible almost anywhere, and the speeds to match or even wild exceed that of fibre ie countryside (where ADSL reigns supreme) 5g could easily put speeds of 1gbps in reach. Virgin must be getting nervous. BT have already bought EE and know whats up. It looks that way and why shouldn’t it? If I order a 100Mbps package and receive 100Mbps, why should I care what medium it comes to me on? It might become dominant in the last 50 metres, but there’s not enough resource available for everyone to get high speed by radio without there being lots and lots of terminals fed by co-ax or fibre. Fibre to the top of the pole, radio into the house – that kind of thing. And how many of those with FTTH/P will use wifi to connect their devices? The answer is the vast majority, of which most will connect using wifi G or N devices even if their Wifi access point does ac and won’t know or care their not getting full pelt out of their connection. Unless your technical and ensure your connected at the highest rate it’s likely your kit is making the most of its internet connection, hence between 50 & 100 mbs is most likely enough for the great majority on faster connections. I get 50+mbs from 4g in all rooms in my home without doing anything special. As way of an update. Boundless will be looking to launch our ultrafast services to an expanding area across North Yorkshire, West Yorkshire and Lancashire over the next few months. 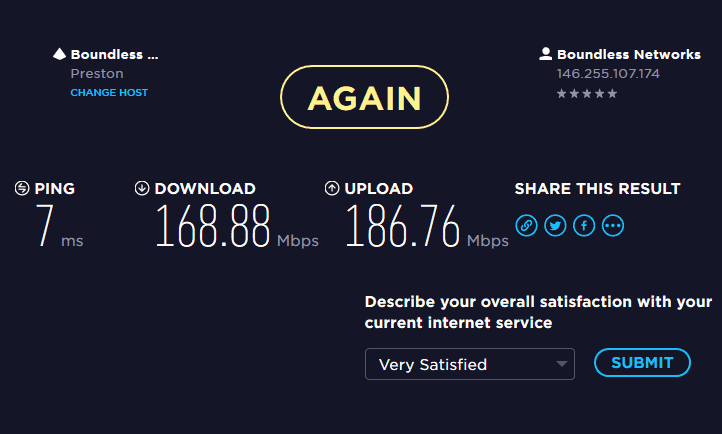 Pricing should be fairly competetive with 100Mbps services being available for around the £50/mnth price point. We will also be offering 150Mbps and possibly 200Mbps where there is customer demand (both residential or business).